​The Economic Justice Action Group has an ongoing Book Club which selects a book and then meets to discuss it. Location of meetings and time of meeting varies. Book Club meetings are the first Sunday each month from 4 to 6pm. If you would like to join us, please contact Wili Bautista. The current selection is listed below. 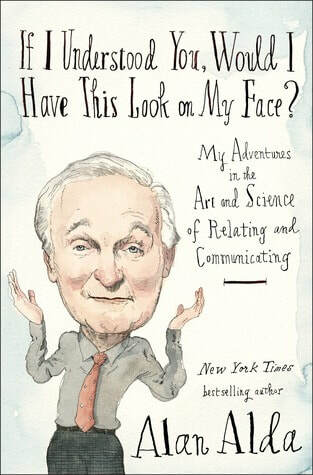 Alan Alda has been on a decades-long journey to discover new ways to help people communicate and relate to one another more effectively. If I Understood You, Would I Have This Look on My Face? is the warm, witty, and informative chronicle of how Alda found inspiration in everything from cutting-edge science to classic acting methods. His search began when he was host of PBS's Scientific American Frontiers, where he interviewed thousands of scientists and developed a knack for helping them communicate complex ideas in ways a wide audience could understand--and Alda wondered if those techniques held a clue to better communication for the rest of us. In his wry and wise voice, Alda reflects on moments of miscommunication in his own life, when an absence of understanding resulted in problems both big and small. He guides us through his discoveries, showing how communication can be improved through learning to relate to the other person: listening with our eyes, looking for clues in another's face, using the power of a compelling story, avoiding jargon, and reading another person so well that you become "in sync" with them, and know what they are thinking and feeling--especially when you're talking about the hard stuff. Drawing on improvisation training, theater, and storytelling techniques from a life of acting, and with insights from recent scientific studies, Alda describes ways we can build empathy, nurture our innate mind-reading abilities, and improve the way we relate and talk with others. Exploring empathy-boosting games and exercises, If I Understood You is a funny, thought-provoking guide that can be used by all of us, in every aspect of our lives--with our friends, lovers, and families, with our doctors, in business settings, and beyond.